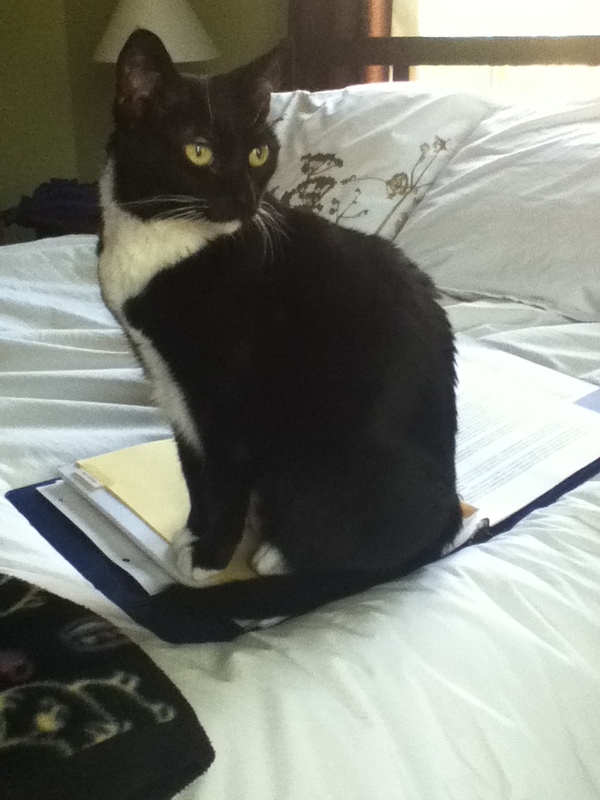 Obligatory cat picture of the week: Maggie “helping” me with my work. I have met my goal of blogging daily for the entire month of April—hooray! A goal I actually met! It’s a miracle. And I’m going to do my best to continue. It hasn’t been terribly difficult so far, but I’ve run through much of my previously developed content. My biggest worry is becoming repetitive, especially as my writing process is a bit stuck at the moment in the same phase over and over again. I don’t want to (and honestly can’t) rush to the next phase of writing, but until I get there, writing the same posts about development and doubt will get old, if it hasn’t already. I do have another round of “Developing Ideas” that I could share, the long road to nowhere. I could continue throwing horrible poetry at you. And I could start doing reviews. So I feel confident I can continue to post daily. I suppose the question is: Should I? In his book Show Your Work, Austin Kleon suggests sharing something every day—he’s mainly suggesting sharing elements of your process, but I think a blog post would count. And I know that if the authors’ websites I like to check posted every day, I’d be the first to read them. But I’m not an author, nor am I that interesting or helpful, so I don’t know if anyone out there is really listening. But this isn’t just about finding an audience, or a community to share with, though those things are a part of my goals. It’s also about developing the habit of self-promotion, and sticking to a goal to write something daily. I hope that someday I can write about my drafting process, and then about seeking publication, and then (with the grace of God and the universe) maybe about being a published author. Those are journeys I would like to read about, so I’d like to write about them. The first step, I guess, is to start writing. So you’ll keep hearing from me, whoever you are out there (if you are there at all). Thank you for reading… and whether you care or not, I’ll keep writing. This entry was posted in Blogging and tagged blogging, Cats, daily, photo. Bookmark the permalink.